* Bulk purchase: Please contact our customer service to arrange pallet transport. 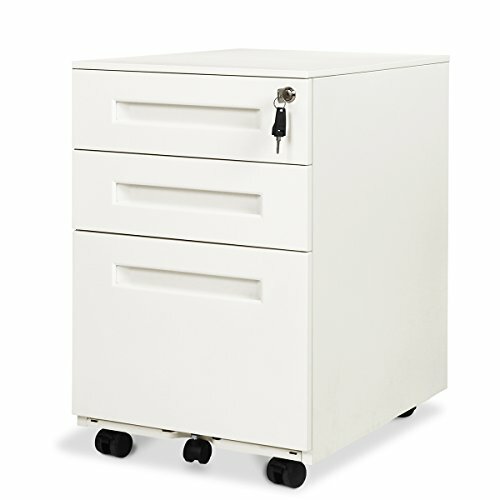 23.6" height - 3 drawers mobile filing cabinet fits under most desks. 3 Lockable Drawers: A built-in lock with 2 keys controls all three drawers. Two stationery drawers and one filing drawer with one removable hanging bar accommodates A4, letter and legal size. Five casters: 2 front casters with brake function, 1 auxiliary wheel under file drawer prevents tipping. Overall Dimensions:15.4"W x 19.7"D x 23.6"H ( 22"H without casters ); Fully assembled except the casters. If you have any questions about this product by DEVAISE, contact us by completing and submitting the form below. If you are looking for a specif part number, please include it with your message.